They say it’s lonely at the top but, if you learn from the wisdom of Laura Grondin, Virginia Industries Inc. CEO and Chair of the Committee of 200, the finest leaders are built with the help of a powerhouse network. As the executive who runs a major corporation that owns top suppliers of parts for the automotive and utility industries, Grondin knows how hard it is, as a woman, to rise to the top of her field. In recognition of this need, in 2015 Grondin took on the influential role of Chair of the Committee of 200, an organization dedicated to celebrating and advancing women’s leadership. Known as C200 for short, the group was founded in 1982 as a vital network and community for women with common leadership experience and like-minded goals. 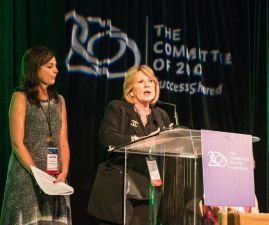 Five years later, the organization created The C200 Foundation to provide learning opportunities, scholarships, and mentorship programs to help advance the next generation of female entrepreneurs and leaders in the corporate world. At the heart of the C200 mission is the push to help women overcome the unique challenges they face in rising to and succeeding at the top. This is a problem that every one of C200’s members has had to overcome. All of C200’s members are top businesswomen from around the world and from across a wide variety of corporations. Together, they employ more than 2.5 million people in 100 industries spanning the globe. Half of the C200 membership runs businesses with revenues exceeding $100 million. In short: this is a group with some very serious sway in the international business community—and Grondin and her membership want to help grow their numbers. Originally, the organization sought to unite female entrepreneurs. Only later did the group begin to admit corporate leaders as well. “Currently, we’re about 50% entrepreneurs, 50% corporate executives. The balance gives strength to the community—having both types of leaders in the same room is a key differentiator from other organizations,” Grondin says. For those women who join the C200, it’s a lifelong membership in a very impressive and exclusive club. Members enjoy unrivaled access to leaders around the globe and can take part in learning opportunities that grow their skillset and their networks. 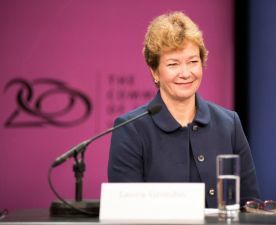 Just by joining the organization, women are immediately connected with their fellow C200 members who sit on the boards of General Electric, Coca-Cola and Visa, to name a few. Other members include the first female network television president Kay Koplovitz, the first female U.S. Senator from Texas Kay Bailey Hutchison and the first female to own a seat on the NYSE Muriel Siebert. For a woman to call herself a member of this group opens doors that most of us can only dream of. Grondin can personally attest to C200’s success in helping women advance in business. She says that since becoming a member, the size of her business has doubled, leading her to seek out the advice of other women leaders. “Just finding an organization of very successful women who are peers and above was really fabulous. I’ve learned an incredible amount. It’s been a place to go when I had issues that needed to be solved and I needed to ask ‘I’ve got this guy who’s working for me and I think he’s doing something illegal–What do I do?’ Or: ‘I really want to open a new plant. What are the questions I should be asking myself about the business plan?’ The list goes on and on,” Grondin says by way of example. First, they held “C200 Reachouts” to students in undergraduate and graduate programs. The committee sends leading women in business to speak to students and offer the opportunity for these future executives to ask questions and seek advice. C200 also offers these young women scholarships through its foundation. Second, C200 offers an unparalleled opportunity through its Protégé Program. This effort is specifically aimed at supporting women who are entrepreneurs looking to bring their businesses to the $20 million mark or higher. Third, C200 actively seeks to help corporate women advance into top roles. Recently, three C200 members and a participant in the Protégé Program worked with Diana Reid, the Executive Vice President of the PNC Financial Services Group in Chicago. 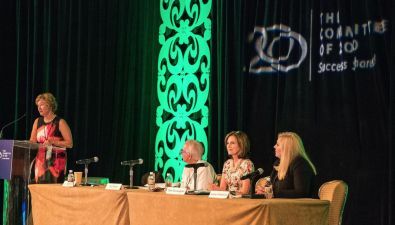 Together, they broadcasted a panel discussion to 2,400 women across the organization to discuss career advancement options in the corporate world. Ultimately the most rewarding part of leading C200 is helping other women achieve what she has. To wit, the group’s foundation has awarded over $1.5 million in scholarships over the past three decades and continues to reach out to tomorrow’s leading women every day.